Although the EU has stricter regulations and has banned many of the most harmful ingredients, cosmetic companies in the United States are allowed to use almost any new chemicals without government approval, with the exception of colour additives and any ingredient classified as a drug. Congress is starting to respond to consumer concerns and, for the first time since 1938, the FDA may be implementing restrictions on ingredients placed in beauty products. Not that that’s much help: after all, the FDA has approved aspartame, saccharin, human growth hormone in food products and many other artificial colourings, flavourings and chemicals which have proven to harm human health. For now it is up to you as a consumer to pay attention to the ingredients and do your research – especially if you have any favourite brands you’re ordering from the USA! Finding high quality, effective, and natural makeup can definitely be a challenge. We have our few favorite brands that we resort to, and we’re always thrilled to discover a new product line to add to our mix, especially since the availability of high quality, natural products pretty much dictates what we do and do not use in our beauty routines! Because of this, we had all but given up on using mineral makeup over the last year or two. Discovering safe mineral products that were free of skin irritants and toxic ingredients like mica, talc, and titanium dioxide had proven to be all but impossible! So you can imagine how pumped we were to discover Epic Mineral Beauty, a beautiful line of mineral makeup products that is free of literally every questionable ingredient on our list! To boot, the mineral foundations, blushes and bronzers come in a variety of lovely hues to perfectly match your skintone, and the eyeshadows come in some luscious must-have basic tones. We found that our skin looked beautiful, natural, and clean, with buildable coverage that lasted. Plus, no irritation, clogged pores, breakouts or skin drama whatsoever! To find your perfect hues, order the sample sizes. Enter our Epic Mineral Beauty Giveaway! You’ll get one full-size foundation and one full-size mineral veil — an almost $60 value! Click here to sign up for our email list (don’t worry, we’ll never hound you with lots of emails! )Leave a comment below letting us know you signed up! And our winner is: Aimee!! 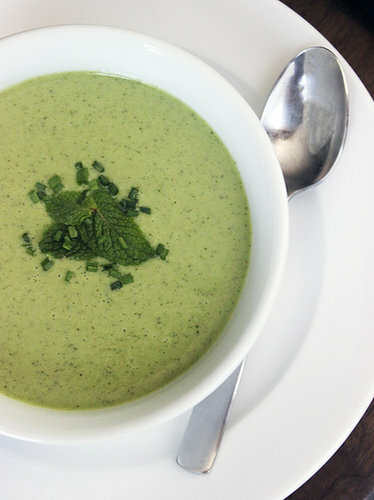 This delicious chilled cucumber soup is super detoxifying, and is a perfect light summer dinner for those balmy nights. The pine nuts add some bulk and healthy fats, giving the soup a super yummy consistency. Due to the high water content of cucumbers, this soup is also amazing for beauty, hydrating skin, and weight loss! Blend everything except fresh mint together until smooth — about 3 minutes in a high-speed blender. Add mint and blend for 15 seconds. Garnish with as extra drizzle of olive oil and a sprig of mint or dill. Serve chilled with some rye toast. A Killer Juice That Bites Back! Being a lover of all things raw, green and juicy, I tend to get a little sad when the warmer months come to an end, and I have to start replacing my daily green juices and smoothies with more warming foods. Unfortunately, these amazing nutrient powerhouses are just too cooling for most bodies during the cold weather months (you may notice that you just feel colder in your hands and feet, or feel more spacey or anxious when you eat a lot of raw foods or drink green juices in the winter). But the fall is still a lovely middle ground. It’s starting to cool, and there is still tons of great seasonal produce to rock in some delicious green concoctions, as long as you add some warming ingredients that add a little bite! This yummy juice makes use of delicious late-summer/early-fall produce and packs an awesome, anti-inflammatory punch to warm your body from the inside out. Instead of the usual kale or spinach, I love using Swiss chard in this juice. This often overlooked green is loaded with 13 antioxidants, including heart protecting, blood sugar regulating flavonoids. Along with the beets, Swiss chard is full of the phytonutrient betalain, which is super detoxifying and vital for disease prevention. I like to top my juice with a little sprinkle of cayenne pepper for even more of a detoxifying and slimming boost! Is your juicer no match for the dense, fibrous goodness of these fruits and veggies? It’s probably time for an upgrade. I’m in love with my Breville Compact Juice Fountain that I got at Williams-Sonoma (though I’ll be honest, I’ve had my eye on the Kuvings Whole Slow Juicer and it’s cold-pressing magic for a while). Not sure which juicer is best for you? Check out the W-S Juicer Guide to help you find your new favorite kitchen tool! If you’ve been reading The Organic Beauty for awhile, you know that my number one secret for gorgeous skin and hair is oil. I use it to wash my face, moisturize my skin, and condition my hair (among many other beauty tricks). Being a slightly lazy organic beauty, I opt for simplicity — pure jojoba, argan, and coconut oils. But simple can definitely get a little boring. So I was super excited to discover Arya Essentials Ayurvedic oils, which are anything but boring. Handcrafted in Brooklyn, Arya (Sanskrit for noble, precious, and pure) oils for face, body, and hair are loaded with super powerful ayurvedic herbs like brahmi, tulsi, and amla which slow aging, boost collagen, and promote hydration and glow. I am a huge proponent of using these powerful herbs internally for holistic healing and wellness, but they are just as effective and magical when applied externally as well. Plus, they smell absolutely amazing. The face oil has a nourishing base of argan, jojoba and sweet almond oil, which are my top picks for youthful, clear and glowing skin, while the body oil features a slightly heavier base of sesame and coconut oils, which are ideal for deep hydration and soft, silky skin. And did I mention how delicious they smell? Earthy, peppery tones waft off your skin, leaving you feeling like the exotic goddess that you are. Get That Body Moving.. In just 15 min a day! One of the biggest reasons (excuses?) I hear for why people can’t work out regularly is TIME. Finding time to work out can be a challenge if you think of it as working out. It’s a chore. A bother. Something to fit in. What if instead of working out, you were simply making room for moving your body in a way that feels phenomenal, energizing, amazing? What if this movement made you look and feel awesome in your body, and it was actually FUN for you to do? What if it only took a time commitment of 15 minutes a day? Would you do it then? Who doesn’t want to look and feel amazing, and have fun doing it, right? Well, this isn’t another fad or scheme. This is just about you finding what feels good. I used to drag myself to group fitness classes I hated, and force myself to get through cardio videos at home that made me miserable. Working out was a punishment. It was something I had to do OR ELSE. Then I said screw it. I decided that I would only do forms of movement that I love, and that feel amazing. For me, that’s yoga, Pilates, and ballet/barre workouts. I love those. I always feel more elegant, beautiful and slender. I never feel drained or miserable, or like I’m punishing myself. And guess what? Once I decided to stop making myself do workouts I hated, and only did those I love, I found that I was moving my body more often, getting into awesome shape, and feeling phenomenal. Now, I CRAVE my favorite forms of movement. If I skip a few days, I feel it in my bones. Not in a holy-crap-I’m-going-to-get-fat panicked way, but in a my-body-misses-feeling-amazing way. And I’ll tell you what, that is some killer motivation. Even if I don’t have time for a full yoga class (and lately, I don’t), I make a point of moving my body in the morning for at least 15 minutes, 5 days a week. The other days, I’m out biking or walking or doing something else physical. I never feel like I’m working out, and I never feel the pressure or weight of something I have to do. So my advice is this: find what movement moves you, and do that, for just 15 minutes a day. To help you along, I’ve created a YouTube playlist with a whole bunch of different workouts, all of them anywhere from 10-20 minutes long. Check out my Youtube Playlist of Quick Awesome Movement! —> For all you yoga lovers out there… Here are my playlists for Relaxing and Energizing Yoga routines you can do anytime! —> For you total beginners, here’s my playlist for Beginner Movement! —> Need some more help figuring out what kinds of movement you’d love? Check out my article, What’s Your Exercise Personality? Sweat Outdoors for a Mood-Boosting, Stress-Busting Workout! I am not a gym person. I cringe at the very thought of having a membership to sweat indoors. When I have belonged to health clubs, it was more for the hot tub, the sauna and the occasional yoga class (before I discovered studios, and before I was a yogi). But yeah, the gym? Soooo not my thing. Never has been. 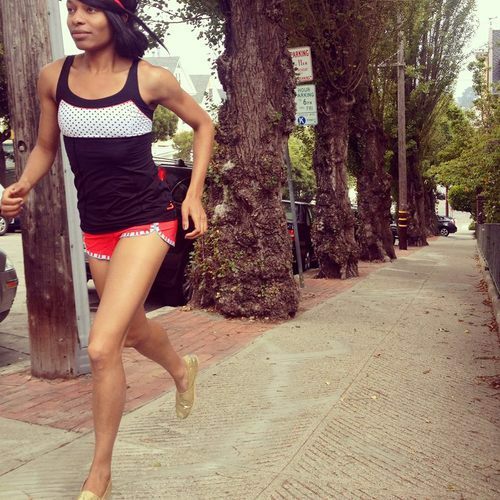 As a runner, I’ve always enjoyed my cardio done outdoors. And studies are showing that there is something to that! Perhaps I am spoiled. I live in San Francisco, one of the most beautiful cities in the country and in the world. And in said beautiful city, I live in the woods near the beach. I mean, who needs a gym when there are trees and ocean? These are simple, natural things that our planet and our bodies need. Simple things that cannot be found indoors. I live in a world (and a city) of possibility; I wonder if we can make that one happen. Last Monday, I woke up feeling a little “meh.” I had tons on my plate between clients, my upcoming program launch, and preparing for my trip home to Minneapolis, but I was feeling some resistance toward jumping into my super productive morning routine. These days, I know that when that happens, it’s rarely for no reason. When I feel “meh,” unmotivated, or run down, I know it’s because I haven’t been taking well enough care of myself. I know what I need in those moments… SPACE. So I did what I needed to do… I started the morning off nice and slow. I meditated, did some pilates, journaled, made my favorite green superfood smoothie (click here for the recipe! ), watched some news, and read. I didn’t even start working until about 11am. And it felt amazing. As the morning went on, I felt more and more myself. More and more taken care of. And there’s the clincher. We all know we should be heeding the needs of our bodies and minds, but that guilty little voice just keeps getting in my way. I see it every day with my clients, and that feeling just increases exponentially with the number of responsibilities that are on your plate. School, work, kids, family, friends, even our fun social lives all end up taking precedence over our SELVES and our deepest needs. And the second we think of putting ourselves first, we panic and guilt ourselves out of it. I myself have been working through a little process of overcoming this guilt that I want to share with you. Try it out and see how much more space you can create for yourself in your life! 1. Realize that you’re not being SELFISH. A happier, calmer, more balanced you equals being more productive and less stressed out at work, being a better mother, partner, and friend, and makes you more able to take care of all the things in your life that require your attention. Once you frame it that way, it’s a lot easier to see that you’re not being selfish by taking care of YOU, you’re just better equipping yourself to deal with what comes your way. For me, this means reminding myself every day that I am a better counselor, a more moving wife, and a more productive entrepreneur in my business when I feel like I have the space to care for myself. A happy me benefits everyone in my life! 2. Take baby steps towards creating space. You may not be able to go from stretched thin and overworked to taking the morning (or the whole day!) off to take care of yourself overnight. Start small by creating little pockets of space for yourself. Maybe it’s a long walk without your phone after lunch, or not checking your email after 7 or 8pm, or building 10 extra minutes into your morning for a mediation practice or some movement. Resist the all or nothing mentality that can just keep you stuck in a rut. The more space you create, the more you get used to the feeling and all it’s benefits, the less guilt you experience. 3. Notice the measurable impact. Nothing kills off guilt like sound reason and justifications, right? So make sure to notice, and even write down, the benefits you notice from your space-making. Do you feel less annoyed by your coworkers on a day when you take time to meditate in the morning? Are you more patient with your kids on a day when you took a long lunch and enjoyed some quiet time? Are you more forgiving of your partner’s quirks after a night of staying in and rejuvenating yourself? Making these connections is super important towards creating a new relationship to self-care. Often times we feel great/happy/calm/connected, but don’t take the time to recognize what behaviors or choices contributed to our feeling that way! For me, this means seeing how much more work I get done, and how much more I enjoy doing it, on days when I listen to what I need. Share your experience with these steps and eliminating the guilt of self-care in the comments below! I started using Biosolis sunscreens a few months ago, and am totally obsessed. I use the Sun Milk for Face and Body SPF 30 on myself, and love the smooth texture and awesome protection. Loaded with skin soothing and protecting ingredients like aloe, rapeseed and sunflower seed oils, and carrot root extract, this sunscreen does so much more than keep your skin from burning! Another key ingredient is karanja oil, an Ayurvedic ingredient that helps to heal and restructure the upper layers of skin, preventing premature aging and amplifying the results of mineral sunscreens. For the littles, there’s the Kids Sun Milk SPF 50, which has many of the same skin protecting ingredients but with an even higher SPF to ensure that baby soft skin stays safe! Biosolis mineral sunscreens are non-nano, which means that the minerals stay on top of skin, where they offer the most protection, and don’t get absorbed into the bloodstream (this is especially important when picking a sunscreen for your kiddos!). On the other hand, non-mineral chemical sunscreens penetrate skin with toxic ingredients that are made even more volatile under the hot sun. These chemical sunscreens are also super damaging to delicate coral reefs and ocean eco-systems, making them a disastrous choice for the environment. Biosolis non-nano mineral sunscreens are clean and free of pollutants, petrochemicals, silicone oils, and synthetic fragrances, and they come in environmentally friendly packaging, making them a great choice for our bodies and the planet. Their ingredients are certified as safe and eco-friendly by two independent European certifying bodies (which have much higher standards for safety in cosmetic products than the US), Ecocert Greenlife and Cosmebio, so you know exactly what you’re getting. Now, on to an amazing, healthy day in the sun!! Since little Margaux came into the world two weeks ago, I’ve definitely been on hiatus from all things cooking. But the perfect combination of my mom napping with the little babe and a sudden burst of energy on my part (probably due to my placenta pills… But more on that later!) led to my first venture back into the kitchen to make a super yummy adaptation of a recipe I saw on Greatist. Anyway, this gluten-free, flourless protein cookie recipe looked like just the thing! I modified the ingredients slightly to increase the healthy fat factor (super important for making milk and keeping energy high) and bind the cookies together a bit more. But try these puppies out – they don’t disappoint! In a large bowl, stir together oats, cranberries, protein powder, almonds, and cinnamon. In a separate bowl, stir together almond butter, maple syrup, coconut oil, and almond milk. Form into cookie sized balls, drop onto a non-greased baking sheet and bake for 10 to 12 minutes. I hope to inspire you to live beautifully and healthfully, in a life you love!